Over 110 songs from the golden age of music. All lore friendly. This is just continuous music with no DJ or commercials added. A craftable radio is available in the workshop so your settlers can enjoy as well. XBOX and PC versions also available at Bethesdas site. Seddon4494 for his radio tutorial on youtube. And to good o'l trial and error as I'm somewhat new to modding. Adds a new radio station with over 110 songs from the *Golden Age of Music. All lore friendly tracks. This is just continuous music with no DJ or commercials added. 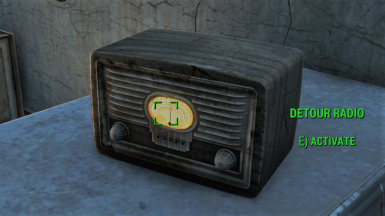 A craftable radio is available in the workshop so your settlers can enjoy as well. The new station uses radio frequency 87.0 and will conflict with any other radio mods using the same frequency. XBOX and PC versions also available at Bethesdas site. This is my first time uploading one of my other mods to Nexus. Please let me know if it isn't working so I can attempt to fix it. Currently, it's working fine on Bethesdas site on both PC and Xbone (PS4 not available for obvious reasons). Civilization (Bingo Bango Bongo) - Bob Hilliard and Carl Sigman and sung by Danny Kaye with The Andrews Sisters.